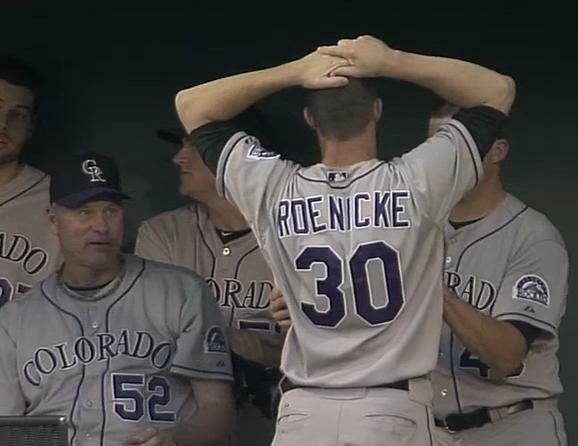 Turning Point: Nelson's home run gave the Rockies the lead and is an obvious selection. But I'm thinking the 2nd inning where Jeff Francis pitched around a lead-off double and a Jordan Pacheco throwing error to keep the game at 1-0 was the big moment in the game. In Philly adds on there, who knows which direction this game goes. To pitch five innings (and therefore qualify for a victory) under Jim Tracy's new whacked out scheme, it's going to take an efficient outing void of walks. That's exactly what Jeff Francis provided today, and under a rational, logical system, he's probably good for at least two more innings. But nah, we'll just stick to looking like a Mickey Mouse organization. No problem. And the Rockies won tonight and should have won last night, so this system may last longer than the two weeks I originally predicted. I don't know. Not sure I want to. What's Next: The Road To 100 gets a little easier as the Rockies pack their bags and head to Arlington, Texas. And lucky us, we get to see Roy Oswalt as he makes his long-awaited Rangers debut. The Rockies will counter with Christian Friedrich (3-4, 5.60), and I'm betting the under on him lasting three full innings. First pitch is 6:10. Final Thoughts: Not to rain on the victory parade or the fact they nearly stumbled into winning this series in Philadelphia, but what's the most lopsided scoring difference for a three-game series in MLB history? Whatever it is, I fear we may challenge it this weekend.